Seeing the NYC in such an intense light (mostly red) from the previous blog entry, “Past New Yorker As A Tourist” all of us desperately needed the rest from lights, crowd, billboards, etc. Essentially we had to be somewhere else other than New York City! It was a sensory overload from our first day in NYC! However the second day started differently…almost like we were somewhere else. Our second day started with a fairly light schedule; getting up around 8:00 am, having a breakfast from the hotel lounge, and waiting for the famous NYC rush hour to pass so that we can all walk and take the subway uptown to Columbia University, my alma mater. The plan was to spend sometime at the school, check out my old architecture school classrooms, take some pictures, buy souvenirs, like all the things I did years ago as I was one of the students attending Columbia. After taking the red line subway uptown, and getting off at the Columbia University subway station, I was back at where my graduate education started years ago: main entrance to the university. It looked exactly the same as it had been back in 1998, even the street vendors around the entrance seemed the same! I am not sure what I was expecting….but somehow I was surprised at the unchanged familiar setting. While being the tour guide to mom and sister, pointing to every corner at the school brought me old memories of the school. After making sure to have the lunch at one of my favorite restaurants near the university, it was time to explore the city once again. We decided to leisurely take a walk along the Broadway Ave. heading south since we went overboard with ordering way to much food, and then even completely finishing every plates, we needed the “leasurely walk”! Then all of us saw it at the same time: small park (more like a left over green space) embedded as part of the street right in front of us. It was very tiny green space….however, seeing it in the middle of the street with rows of benches along the street could not have happened at a better moment! It was a great spot for all of us who were desperate to have another breather from the city that is known to not sleeping. After spending sometime sitting at the benches and taking pictures, I wanted to check the name of the parkette on the map. It was located near along Broadway Ave and somewhere near 90’s street. However, I could not see it on the map! Having the world-famous parks such as Central Park in the city, the small inconsequential parkette would not be significant enough to be registered on the map. Maybe it is not even a parkette, but “left over land on the street with benches and trees surrounding them? However, sitting in one of those benches, all of us momentarily forgot that there was a busy street right next to the trees which were whizzing through the NYC street! I found the “left over” green space to be working in an organic way…. not like the perfectly planned and designed parks we pay to go see. It looks like the parkette “grew” to become the comfortable unassuming spot where only the locals get to see. 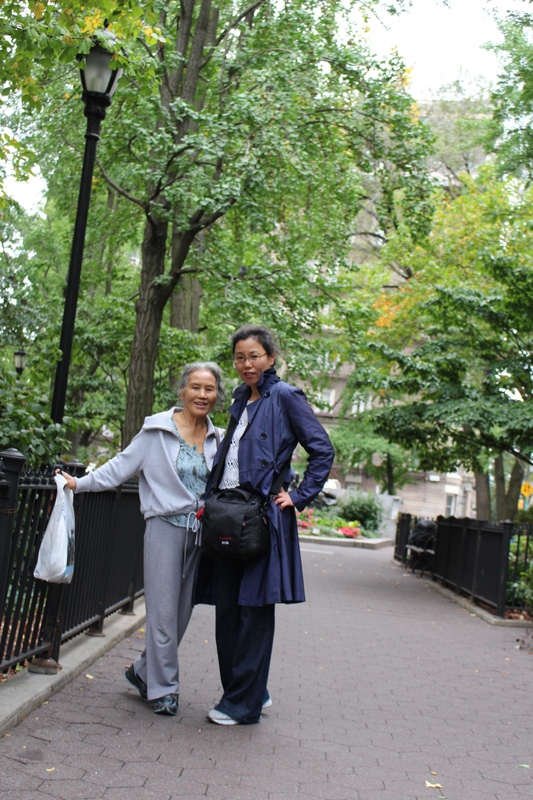 Having experienced this unexpected green space in the middle of a busy NYC street at a perfect moment (remember the huge lunch!) to rest and get some mom and me photo sessions. Learning to enjoy the moment without the maps (notes, to-do list, calander, etc.) do not come to me easily. However, recognizing the unique opportunities can only come from “going with the flow” style of traveling makes easier to try this new traveling approach! 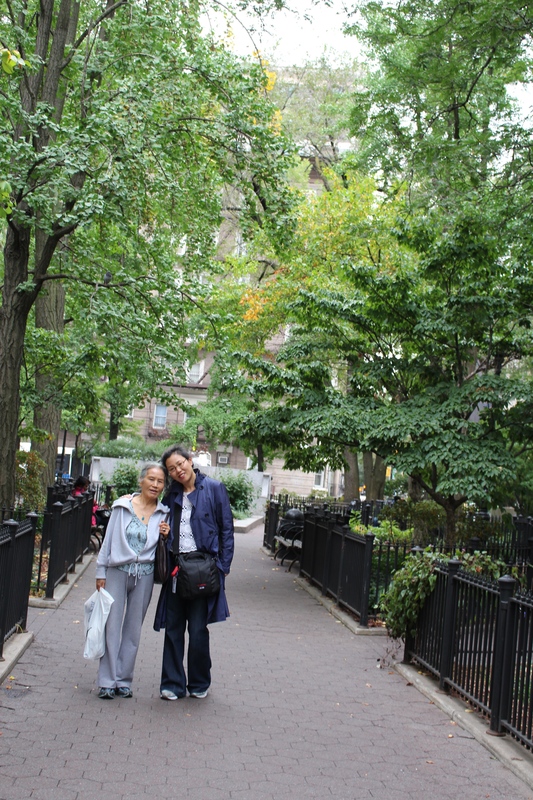 Just look at the photos of mom and me looking happy in a “no-name” park! Seeing the NYC in such an intense light (mostly red) from the previous blog entry, https://onahjung.com/2014/11/19/past-new-yorker-as-a-tourist/ all of us desperately needed the rest from lights, crowd, billboards, etc. Essentially we had to be somewhere else other than New York City! It was a sensory overload from our first day in NYC! However the second day started differently…almost like we were somewhere else. Learning to enjoy the moment without the maps (notes, to-do list, calendar, etc.) do not come to me easily. However, recognizing the unique opportunities can only come from “going with the flow” style of traveling makes easier to try this new traveling approach! 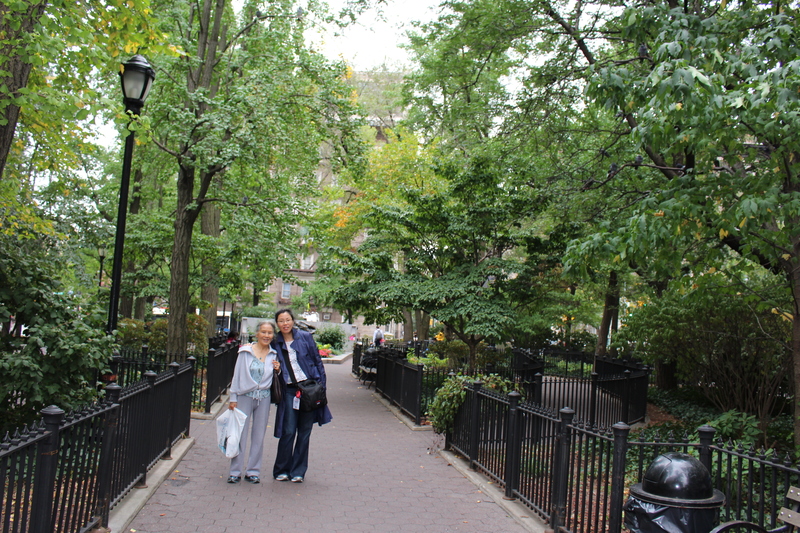 Just look at the photos of mom and me looking happy in a “no-name” park!